Trying to find the best carry-on luggage for your next trip? We’ve spent countless hours looking for both hard shell and fabric carry-on suitcases that match everyone’s budget. 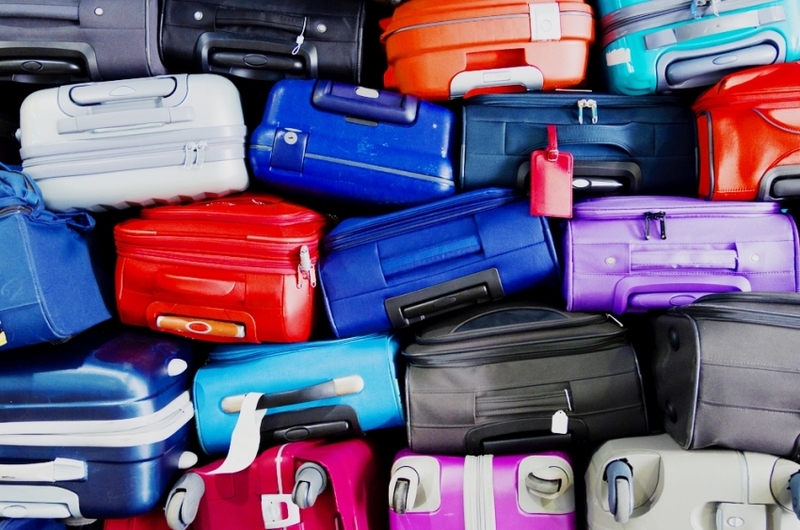 We have a list of 9 carry-on bags that are categorized by their costs. The carry-ons are separated into sections that include: budget ($), mid-priced ($$), high end ($$$) and luxury ($$$$). We have 2 carry-ons for each section, one hard shell and one fabric. The 9th bag is a bonus on the list displaying the technological advancement we are making with carry-on luggage and luggage in general. 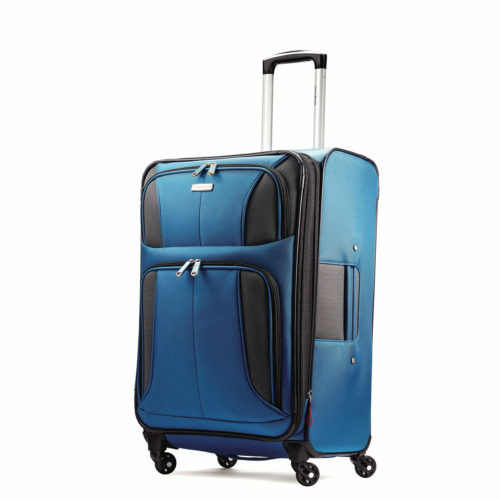 Once you’ve decided on your carry-on bag, check out our list for top spinner luggage as well. 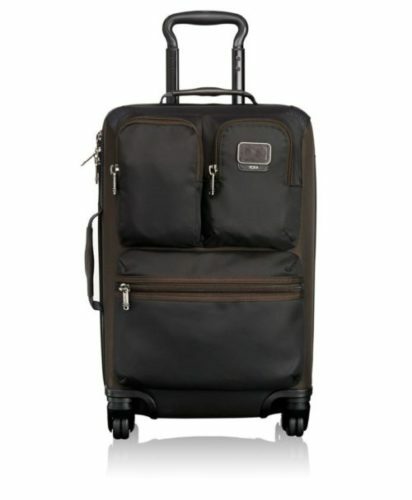 The Kenneth Cole Reaction Out of Bounds carry-on makes its claim for the best hard shell budget carry-on. Now I’ll state the obvious, this carry-on isn’t the best thing to look at even though it’s offered in a number of colors but it’s extremely durable and has excellent interior design to compartmentalize and pack tightly. This budget hard shell carry-on is made of 95% abs plastic making it extremely durable. It stood up to our tests and we didn’t see any scratches or imperfections after our test. It doesn’t hurt that it includes molded reinforced corners for impact resistance. You might think something of this durability would be heavy but the opposite is true; the construction of this carry-on is built to be light weight as it should be. The inside of this carry-on has some great designs. It is extremely roomy and comes with a fully lined interior with zippered pockets and restraints to hold your clothes in place. The inside of the lid features a u-shaped zippered pocket that basically treats the lid like a carry-on within a carry-on and allows you to pack as much as you can without worry of it going anywhere since it is zippered, a very neat feature. The top and side handles of the carry-on are flexible and provide easy lift and it also comes with the crowd favorite, four wheels. Although, it did seem that the wheels were a little stiff, perhaps that will get better with more use. 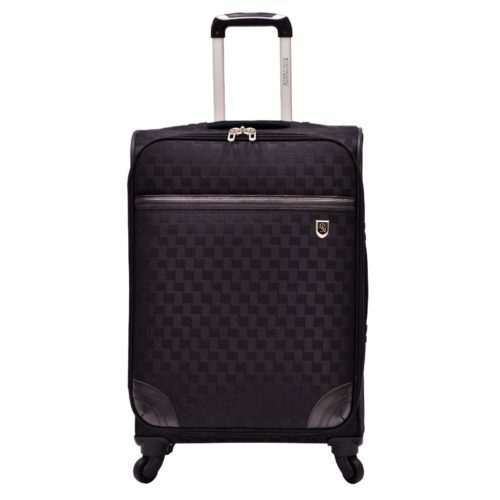 The Kenneth Cole Reaction carry-on comes with a retractable locking handle system which has become standard on any upright. As far as budget carry-ons go, this Travelers Choice carry-on is one of the best and actually gets our approval as the best buy. Not only does it have a great looking exterior design that stands out from the other black luggage on the carousel but it’s very functional for a budget carry-on. Aside from the nice design, this Travelers Choice carry-on has an aluminum retractable handle with a multi-stage locking mechanism. I’ll say the handle didn’t feel that sturdy but it got the job done. 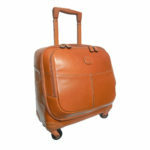 It’s great for getting through the airport with its 4 free spinning wheels which allows for movement in any direction. I personally like to act like I’m juking out the other passengers as I make my way to the terminal. One of the roomiest carry-ons on this list, it comes with the ability to expand which increases its packing capacity by 25%!! I was able to pack another day or two worth of clothes in here depending on how thick the clothing was, once it was expanded. To name some other features, this Travelers Choice comes with an assortment of interior pockets, one padded pouch for your smart phone, one for a tablet and another for accessories. There is an exterior zippered pocket for those papers and documents you need last minute while going through security. There are comfortable top and side grip handles to provide you with easy lifting and they are reinforced so they felt pretty sturdy. There is a multi-purpose center divider inside the suitcase and tie down straps that help keep your clothes from shifting around during your travel. And if you’re worried about this best budget carry-on having a soft exterior then don’t fear; Travelers Choice provides a 3-Year manufacturer’s warranty on your luggage. Find out more about this budget carry-on. When it comes to mid-priced luggage the Delsey Helium Shadow is one of the best pieces of carry-on luggage you could own and is our Top Choice for your next carry-on. It doesn’t have much in the way of style but where it lacks in style it makes up for with functionality. This Delsey carry-on bag basically looks like a giant brick. It’s not flashy and it certainly doesn’t turn any heads. It is also only offered in black or silver so there’s not much choice in that regards. However, its features are pretty great. This is a hard shell carry-on bag that is made with 100% polycarbonate which is built to be extremely durable and lightweight. Polycarbonate is known for being highly impact resistant and it also has a textured finish which helps prevent the carry-on from getting scratched. The Delsey Helium Shadow carry-on bag offers quite a bit of space. The main compartment expands allowing you to increase how much you want to take with you on your trip. Its unique feature that makes it stand out is that you actually load your luggage from the top lid which allows you to pack in tight places or even while your luggage is on a rack. The contents of your luggage will remain safe as well as the Delsey carry-on comes with a TSA approved locking mechanism which allows agents to inspect your luggage without damaging the lock in any way. Speaking of locks, the Helium Shadow features a dual locking handle as well as four spinner wheels which provide exceptional navigation through the crowded terminals of any airport. If for any reason you need something slightly smaller for the airport, check out the international version here. Finally if you’re worried about your belongings or the durability of the carry-on itself then don’t be. This is a hard shelled carry-on which will protect your belongings and the carry-on suitcase itself is backed by a 10 year limited warranty! 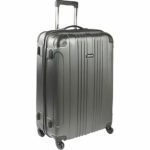 The Samsonite Aspire Xlite is on the lower end of the price range for our mid-priced category but if you know anything about Samsonite you know they make quality luggage. 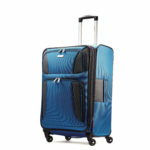 There is no exception with this Samsonite carry-on bag. The exterior of the Samsonite upright is extremely attractive and I’m actually a fan of the red version myself. It’s made from 100% polyester so while it is a soft cover carry-on it does lack some of the protection you would receive from a hard shell carry-on! 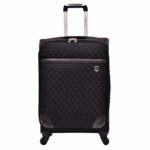 This Aspire Xlite carry-on from Samsonite comes with everyone’s favorite luggage modification, four multi-directional spinner wheels and they work very well too! We had no trouble when pushing it through the crowds at JAX. Samsonite’s carry-on’s interior has organization in mind. Not something you see in cheaper bags, this carry-on has a wetpak and mesh pockets to keep everything compartmentalized. The wetpak was a nifty feature that I really enjoyed using. It allowed me to store my toiletries without having to bring a separate toiletries bag. And of course the Aspire Xlite comes with compression straps to hold your clothing down. The top and side carry handles are nicely padded which provides ample comfort when lifting this upright while it’s fully packed. Samsonite also included an increasingly more common feature, expanded storage to increase your packing capacity. I have flown with this carry-on on JetBlue without issue but make sure to check your airline’s luggage requirements before purchasing. See what others say about their experience using this as a carry-on. This carry-on suitcase was great; however, it did seem a tad bit heavy at times. Which is quite odd considering it’s made of polyester. Also the carry-on is not lockable so if you’re worried about your luggage being tampered with then I would look elsewhere but if you’re carrying it on it shouldn’t be a problem. 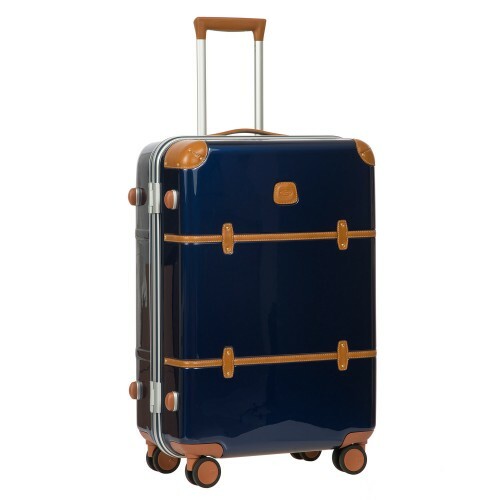 Bric’s is the epitome of designer luggage. This is a brand that anyone who wants to show status turns to. Bric’s is used by a slew of elite socialites and you can join the ranks with this high end yet affordable Bric’s Bellagio carry-on. This carry-on is a hard shell upright with serious design. It is an extremely impressive looking piece of travel gear and comes with over half a dozen different colors to choose from. The shell itself is flexible yet durable. The interior of the Bric’s carry-on has an interior double deck zippered compartment meaning it has a zippered compartment stacked on top of another built into the lid allowing you to pack as much as you need in the zippered area without it falling around the bag. There are also compression straps in the other half of the carry-on of course. 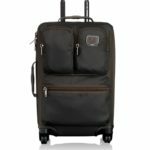 A few other features the Bellagio carry-on has are 4 rubber Hinomoto wheels that glide effortlessly over both soft and hard surfaces, water repellent zippers and TSA approved locks. Just a few final design details, this Bric’s Bellagio is handcrafted and features full-grain Tuscan leather trim belting, again just to emphasize the uniqueness of these uprights. If you have ever seriously researched luggage or owned quite a few pieces in your lifetime then you should be well aware of the awesome brand of luggage gear, Tumi. This Tumi Alpha Bravo Kirtland Continental carry-on is a high end carry-on that certainly shows with its price tag. 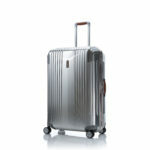 The Tumi Kirtland Continental has an interesting style. It’s unlike most soft cover suitcases or carry-ons in the sense that it has grey camo as an option for your color and honestly at first I wasn’t a fan but the more I look it over the more appealing it becomes. It is designed with a ballistic nylon that keeps the weight down but also makes it very durable. The second thing that stood out to me is the exterior pockets on this carry-on. There are three pockets on the front which allow you to store chargers, papers or other documents that you might need handy while getting your international travel on. The inside of the Tumi carry-on mimics this as the inside lid also has three divided compartments for efficient organization. There are also compression straps that hold your belongings together so they are not shifted during your travel. 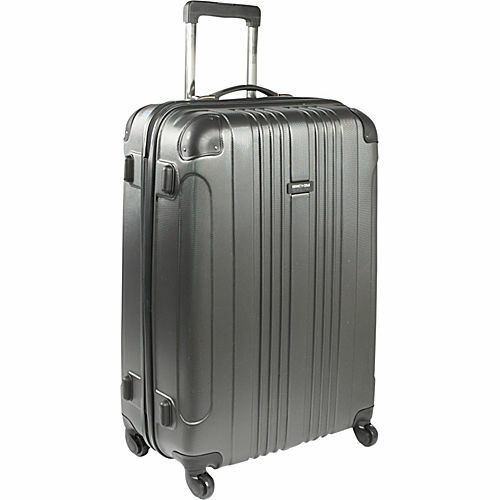 The Tumi Kirtland Continental carry-on is expandable, comes with 4 recessed wheels with wheel skids, a 3 stage telescoping handle and a leather accented top carrying handle that is extremely comfortable to use when you need to actually carry your luggage instead of rolling it. The Tumi Kirtland also includes a removable lock, an area for personalize with a monogram and even a tracer tag to keep your mind at peace. One word of advice, make sure you check your airlines carry-on size requirements as some airlines won’t allow this as a carry-on when it is fully expanded. Once again we come across a piece of Bric’s luggage. This is the Bric’s Life Pelle Pilot. It is a 4 wheeled carry-on that is made of full grain vegetable tanned bovine leather. It comes in one style and that style is awesome, just kidding it’s called Cognac, but still pretty awesome! The Bric’s carry-on exterior features in-line skate wheels like many of our other carry-ons on this list as well as a luggage tag, lock and a premium leather handle grip on the top for easy carrying. The interior of the Pelle Pilot carry-on has a zippered compartment inside the main area as well as a removable computer sleeve inside the opening lid. This is perhaps one of the most expensive pieces of travel gear you can find for the size. It’s a smaller carry-on than the others on this list yet demands such an astronomical amount. This is the Hartmann 7r Master and our pick for best hard shell luxury carry-on bag. This one will set you back a pretty penny but it will surely stand out. It has a unique metal styling that you don’t see anywhere else. The exterior of this Hartmann carry-on has a virgin aluminum, dual tube pull handle with leather carry handles on the top and side. The 7r Master comes with excellent double spinner wheels to get you where you need to go in style. Inside you will find the luxury carry-on has a zippered section inside the lid as well as compression straps on the other half for holding down your luggage. Finally you notice the carry-on has TSA approved lock to keep your belongings secured. There are no externals compartments and the functionality of this carry-on is fairly minimal but it’s a masculine piece that stands out from the crowd and makes its presence known. 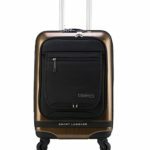 This is the SMART Executive digital carry-on by Numinous London. 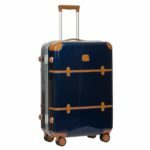 It’s separate from the rest of this list purely because I wanted to include a type of luggage that is adapting to the digital age. To start this carry-on features a TSA accepted bio-metric recognition lock, meaning it recognizes your fingerprint! It actually allows you to store up to 100 different fingerprints so you’re able to use both hands or allow a loved one or friend to have access to it as well. It’s great because there’s no need for keys or codes! This digital carry-on not only thinks about its locking mechanism to keep your belongings safe but it also utilizes puncture resistant zippers which are resistant against pen and tool attacks! The SMART Executive features a 3500MaH built in charger that provides your electronics a charge while on the go. No longer do you need to scour the airport looking for a place to plug in your dead phone. 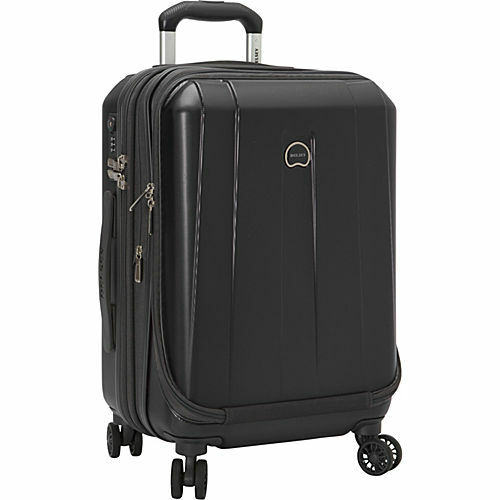 Additionally the outside includes a 17 inch padded laptop compartment, four spinner wheels, an ergonomic handle on top and an extendable handle to either push or pull your luggage around with you. This Executive carry-on is designed for business travelers in mind but that doesn’t mean it’s only for business purposes. Inside we do find a section that’s separated just for files and documents and a separate large compartment for your clothing and shoes as well as compression straps which have become a norm. 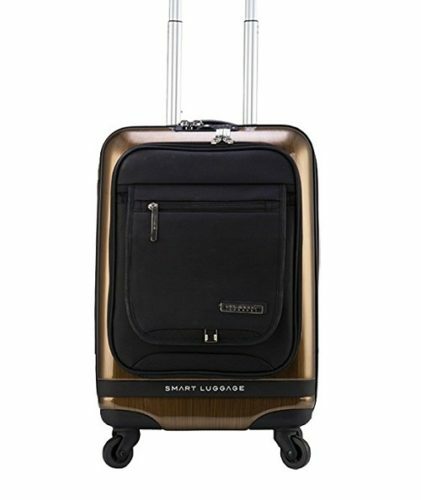 Many people when initially looking for smart luggage might find the Bluesmart One which we considered for this list but found too many issues with it to add to the list. It has some nifty features that the SMART Executive does not have but unfortunately they seem to be hit or miss if they work. If you’re interested in the details, take a look at the Bluesmart One here. When it comes to looking for the best carry-on luggage there are certain things that you want to pay attention to. I take into consideration quite a bit including the durability, functionality, and even the style of the bag in my decision of whether or not to purchase. If you find the right carry-on you could even consider travelling with only a carry-on bag and forgetting the checked luggage. The least important of the three but still a contributor to my decision, the styling of the carry-on bag has to have a few qualities I look for. In my decision when purchasing a carry-on bag I want something that has sleek lines and not something that’s bulky or obtrusive. This not only looks more streamlined but also helps when trying to fit into the cages that size your luggage or when trying to stuff it into an overhead bin. I like options when it comes to color as well as sometimes I want something other than black. Don’t get me wrong the majority of my luggage is a sleek, crisp looking checkered black but occasionally some color looks good as well. Now while we all want to look our best, this can sometimes extend to your luggage as well but again this is the least important factor. Style maybe accounts for 10% of the overall ranking and doesn’t have a lot of weight on my overall decision of what carry-on bags to include in this list. Functionality is a huge contributor in my decision on what to include in this list. It accounts for 40% of the overall ranking. When it comes to functionality I’m looking for the bag to have something interesting or unique to add in addition to the most basic features that we have come to expect with our carry-on luggage. Now this may be easier said than done for the more expensive carry-on suitcases but even the simplest features on a cheaper carry-on suitcase to help improve my time traveling is what I’m looking for. Traveling can be stressful enough as it is, that’s why I’m always looking for something to improve my experience. Some things I look for are I want there to be compression straps, an extendable handle and a clear sense of organization inside the luggage in addition to its unique features. I also make sure that each of these features work as intended, especially the wheels. To go strolling through the airport only to have a wheel fall off is miserable, especially if you’re in a huge rush at a big airport like JFK for example. The most important aspect when it comes to luggage in my mind is its durability and it accounts for 50% of my decision on what to include in this list. What’s the point in having a great looking carry-on with neat features if it doesn’t last you more than a few trips or a few months. When looking at durability, I take into consideration how the exterior holds up to rough handling like you would expect at an airport. I examine how the handles fair through various scenarios and rough housing. I expect the wheels to deal with pavement, cement, carpet and even gravel and if it’s not up to the task for any of those then it doesn’t make the list. Because if you can’t roll the damn thing, then there’s no point in considering the other aspects of the carry-on bag. Along with this one should also consider not just the durability of your carry-on but even the items inside. If you’ve had trouble with lost luggage or missing items in your suitcase before, consider looking for a carry-on that has some sort of locking mechanism or ability to lock, just make sure it’s TSA compliant. Each airline is going to be a little bit different in their requirements for your carry-on. With most airlines as a general rule of thumb, you can get away with carry-on luggage that is 22″ x 9″ x 14″. Again this will vary from airline to airline and you might have to end up checking that luggage or have room to spare but it’s always best to check ahead so you’re not surprised at the gate with an extra change for having to check your luggage on the spot.